I don’t really cook food of the Asian persuasion very often and I wish I did. It’s so healthy and delicious. The problem I face is that I often don’t know what certain ingredients are, or how to use them. This recipe was relatively simple and had ingredients I was able to buy at my local grocery store. 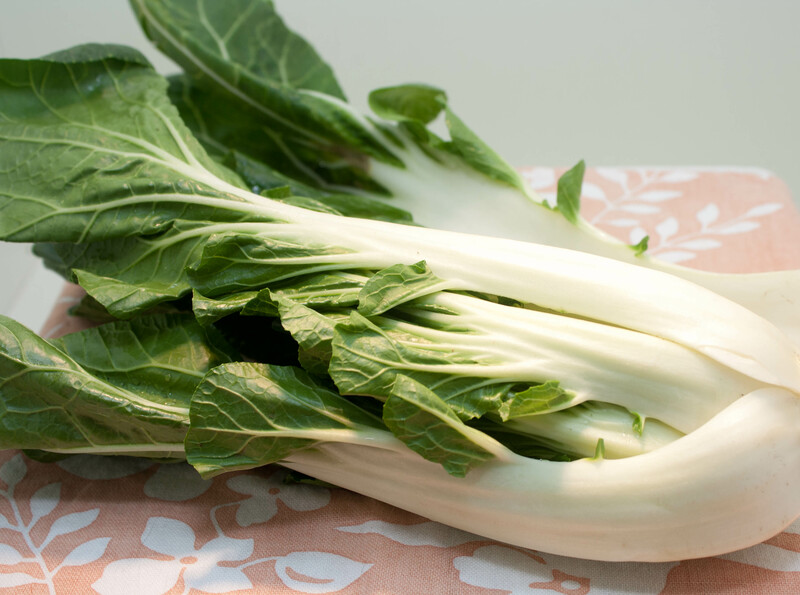 When it came time to make it, I admit I had to google “how to cut bok choy”. Drain and rinse tofu; pat dry. Cut the block into 1-inch cubes. Heat oil in a Dutch oven over medium heat. Add ginger and garlic; cook, stirring, until fragrant, about 1 minute. Add mushrooms and cook until slightly soft, 2 to 3 minutes. Stir in sugar, broth, soy sauce and chile-garlic sauce; cover and bring to a boil. 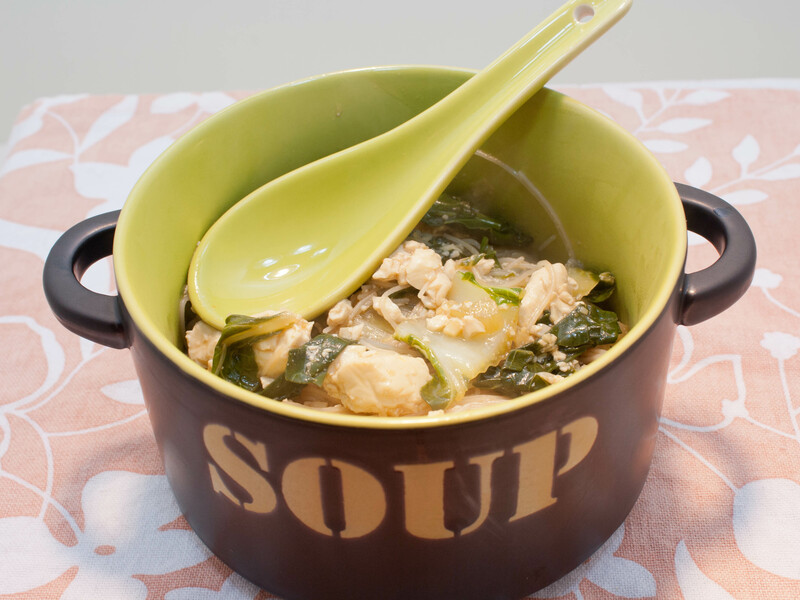 Add bok choy and tofu, cover and simmer until greens are wilted, about 2 minutes. 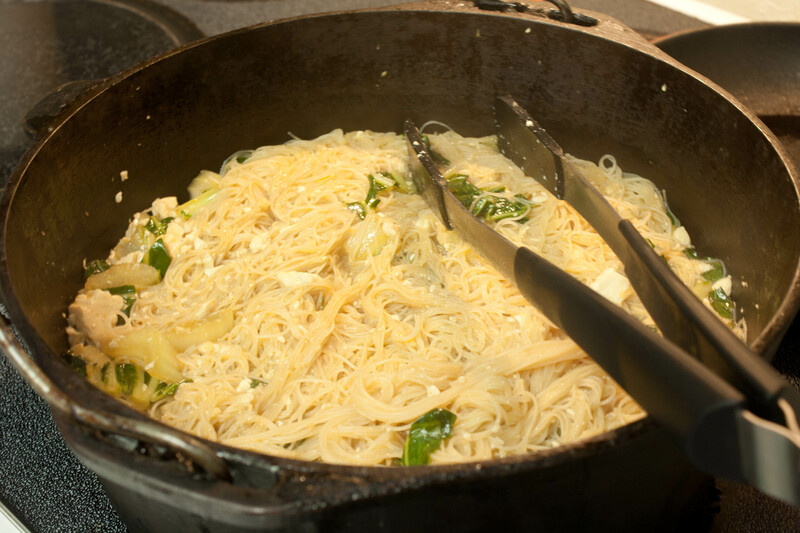 Raise heat to high and add the noodles, pushing them down into the broth. Cook, covered, until the noodles are tender, 2 to 3 minutes. Remove from the heat and stir in cilantro. Note: Chile-garlic sauce is a spicy blend of chiles, garlic and other seasonings; it is found in the Asian section of the market. Two things I should point out: this was not a soup recipe like I thought it was and it could have been spicier. I also think I bought the wrong tofu. I rarely cook with it and it kind of fell apart instead of cubing when I cut it. Tips? Tricks? It’s odd when you have a picture of the final product in your mind and it was completely different. Like I said, I thought it was soup. So when I was adding the noodles at the very end, I panicked. “Oh my god! It’s soaking up all the liquid!” I added some more chicken broth and it soaked that up too. Then I realized, oh maybe it’s NOT soup…I think because I added more liquid it diluted the Sriracha. Despite my mistakes in making this recipe, it turned out really well. It was a noodle dish and despite diluting it with chicken broth, it still had some bite to it. It was also gluten-free and dairy-free. I would definitely make this recipe again and I’d add a lot more sriracha to it. If you aren’t a fan of tofu, you could easily substitute chicken or shrimp and I think that would be fantastic. The recipe says it makes 6 servings but I got about 7 out of it. Before we got home from work Tuesday night, Michael and I stopped at New Seasons (kind of like Whole Foods) here in Portland. We picked up some too-expensive GF and DF items. 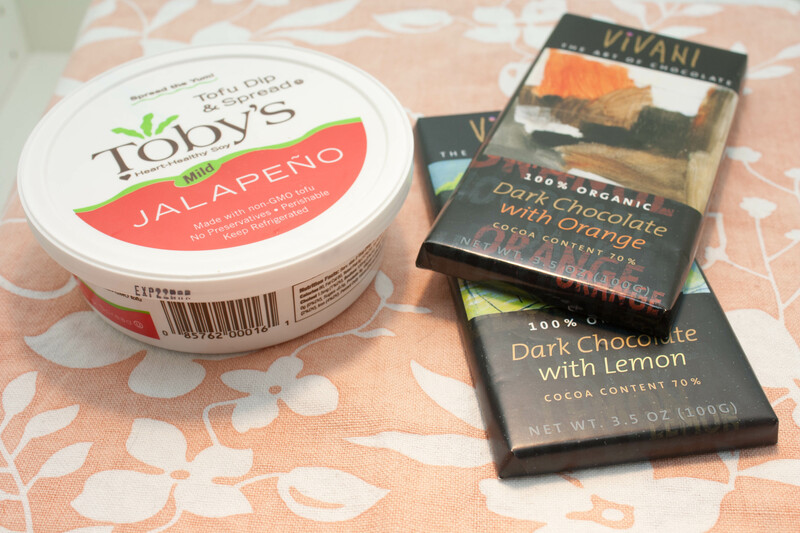 We found dairy free chocolate! And it was divine. I got two flavors: dark chocolate with orange and dark chocolate with lemon. Michael and I ate the whole thing for dessert between the two of us. The dark chocolate was rich and the hint of orange went well. It was much more satisfying than those gluten and dairy free cookies I bought earlier this month. Above you can see we also got a tofu jalapeno spread by Toby’s. I was reluctant to buy it. It was spendy and I was nervous about committing to it in case it was disgusting. It wasn’t. It was…odd…but not gross. It tasted like a cross between guacamole and egg salad. Odd, right? I had a few bites to sample it. I don’t think I’d buy it again but it will work for this challenge. The big win of the night was GLUTEN FREE BEER! Woohoo!!!! I am happy to report that it was REALLY TASTY. Surprise, surprise. I was resigned to giving up beer for the month of February and was okay with it. Michael really wanted to try Omission and I’m glad we did. It was a decent substitution to the rich IPAs I like. I’m really happy to report that there are lots of decent alternatives if you are gluten-free. It really isn’t as bad as I thought it was going to be. QUESTION: Do you cook Asian food very often? Any favorite recipes? Most recipes where I have used tofu, it has stated in the directions to “press” it. I typically will wrap it in paper towels, lay it on a dinner plate, lay another dinner plate on top of it and put 2-3 cans on top. I leave it in the fridge for a couple of hours (or a day), and I have had no problems cubing it. I did press it but maybe I didn’t do it right, or not long enough? I stopped because the tofu was starting to fall apart. I love asian food . . . but rarely cook it myself (well, at least in authentic ways). This looks delicious. I’d suggest not using the Tetrapak tofus, because they always seem to crumble, even when they say firm. Try the extra firm tofu that you can find in the refrigerated section. Those tend to work better! Good to know. I will try a different brand next time. I don’t remember what I used for the last tofu dish I made that turned out great but this one was hard to work with. As a vegetarian I have tried all kinds of tofu and played with the consistency. One thing I’ve notice is that the kind that comes in the plastic containers (partially filled with water) are generally easier to work with (unless you are making smoothies or cream sauces). My favorite way to use tofu as a substitute for meat is to buy extra firm and then freeze it. Thaw it back out, drain it and press it…I mean really try to get all of the water out (as described above or with a tofu press). Your tofu will be spongier and have more of a chewy texture similiar to meat. I make General Taos Tofu that even my meat eating hubby loves. Freeze and press…its the only way to go! Hi Lisa – I cook asian food a lot, probably 2 or 3 times a week. I love all ethnic foods but turn to asian most often because my significant other is part Korean. Also they involve a lot of produce and are usually very healthy. There are quite a few good asian markets around Portland, the key is getting the right ingredients. Lily Market on Halsey is good – they are so nice and helpful if you have questions. In fact they offer advice whether you need it or not. 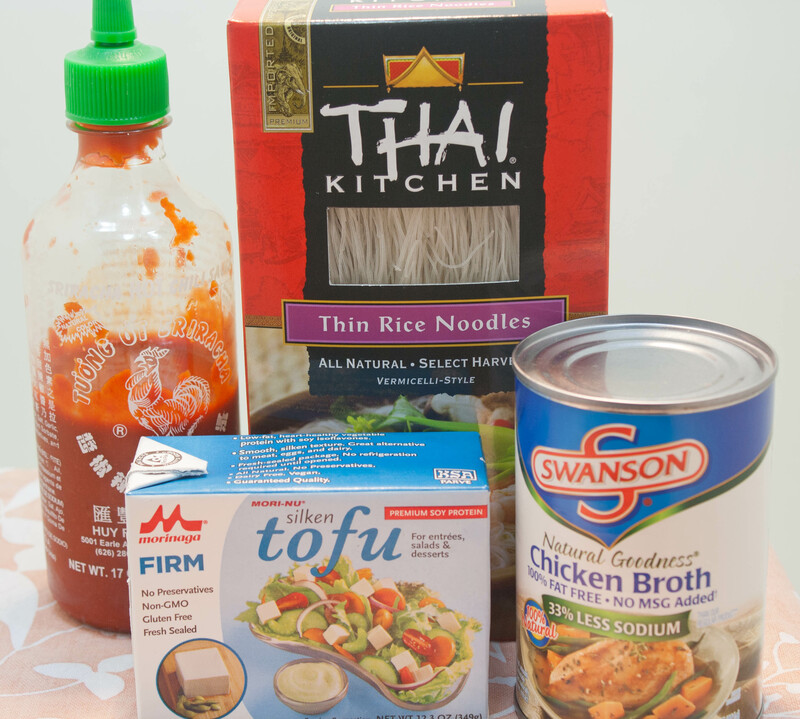 I see American people all the time who take lists or recipes into other asian markets, like Fubonn, and ask for help. One man at Fubonn had a store stock clerk shopping for him! . I LOVE shopping at asian markets, it’s overwhelming at first, but really fun. I find a lot of good authentic recipes online, my favs to cook are thai curries and korean dishes. Thai curries are really versatile – you can use just about any protein and just about all vegetables seem to work. They are not difficult to make, and pretty quick. I always keep a few cans of the curry paste in my pantry along with cans of coconut milk. I add fresh cilantro or thai basil and some lime juice to brighten the flavor at the end. Thanks for the tips, Candace. I wish Uwajimaya was in SE Portland and more convenient to get to. Although, I used to live near SE Hawthorne and there were tons of Asian grocery stores on 82nd that I always wanted to go to but never made it. I will definitely try next time I do an Asian recipe. I do a lot of curries because they are pretty easy. I also love that Asian food has a lot of vegetables. It’s usually a pretty low calorie option. I have not tried tofu yet and this recipe sounds delicious. I will be making it very soon. It was delicious. I will make it again but make it spicier. Don’t discount all the Toby products! I really like the non-jalapeno one (it might be a low-fat version; I think the container is blue). It really is pretty much like egg salad without being quite so eggy. I think they’re from Eugene so you can’t really get their stuff out of state. I missed it when I lived in the Bay Area, though I’m not a rabid fan of it like I used to be. I hope you try the freeze & press technique for tofu and let us know how it goes. I’ll look for it. There were several flavors of the Toby products. I might try their other flavors. And yes, I will try the freeze and press technique. That sounds a lot easier. I love cooking Asian food. And we are so lucky here in Vancouver to have so many asian markets for ingredients. Have a wonderful gluten/dairy free day Lisa. Roz@weightingfor50 recently posted..Happy Birthday Mom! Do you find it difficult to find the right ingredients in Asian markets? Definitely try Extra firm tofu, the silken kind is better for smoothies, etc. I stay away from the stuff since I have thyroid issues (and it doesn’t agree with my tummy). When I *was* eating it back in the day, there was a “cottage salad” that was so yummy. I don’t know what it was trying to imitate, but it was herby and delicious. 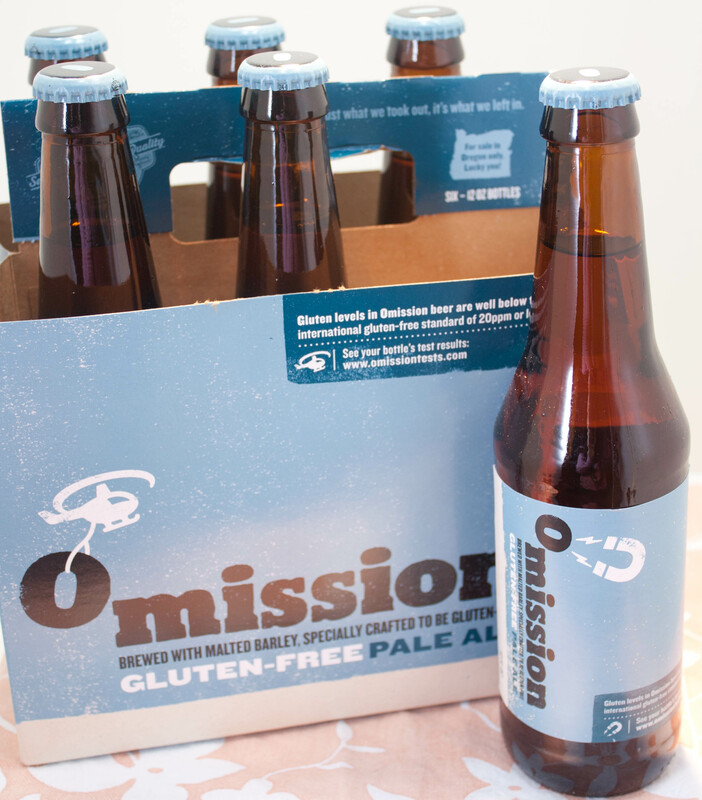 I feel bad I didn’t tell you about the Omission beer sooner. My CEO had it at a restaurant a couple of weeks ago, and then I bought some more at Whole Foods for him. He said it was pretty good, though he’s not a big drinker. That’s ok! I’m glad we finally tried the Omission beer. And I realized that I had had some at the Brewfest last year after I tasted it. I love Asian food! I leave the cooking of it to my fiance though (he’s Chinese). What is your favorite dish your fiance fixes? I haven’t heard of that one. I will look for it next time. I don’t often eat asian food. I’d like to give it more of a try though. I think you definitely scored with that gluten-free beer though. I’ll keep my eyes open for it, or something similar. I’ve always been curious about it and now you’ve convinced me to give it a go. I’ll be on the lookout.